Please download my new ebook Lose Control of your Marketing! Why marketing ROI measures lead to failure. Do you market like the Grateful Dead? Or like Led Zeppelin? (Find out in the ebook). "For many executives, an obsession with ROI is just a convenient excuse to shy away from something new and untested. Yet that's exactly what the best ideas for creating a World Wide Rave are—new and untested." "If you're obsessed with ROI measurements that worked in an offline world, then you're just making an excuse. If you worry about losing control of your message, then you're making an excuse." "For decades, companies have offered Web content as lead bait. But the goal should be to get the word out about your organization, not to misuse the Internet for the sake of an outdated technique." "For your ideas to spread and rise to the status of a World Wide Rave, you must give up control. Make your information on the Web totally free for people to access, with absolutely no virtual strings attached." Please download my new ebook Lose Control of your Marketing! 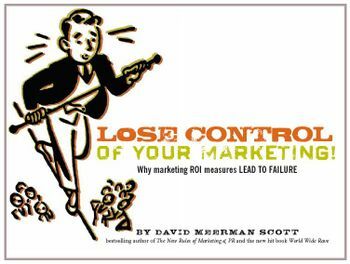 Why marketing ROI measures lead to failure. And please share!